Straight From the Cutter’s Mouth: A Retina Podcast, hosted by Dr. Jay Sridhar, is a wonderful weekly podcast for ophthalmologists, featuring insights from both prominent, as well as up-and-coming retina specialists, about their lives, passions, and work. 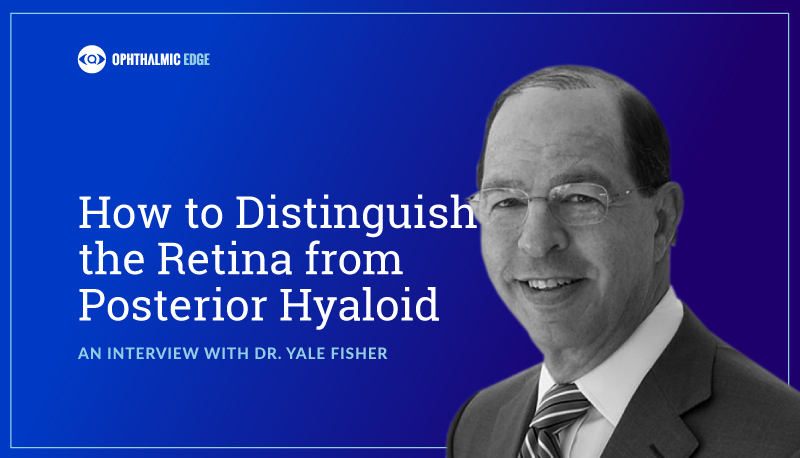 In this episode, Dr. Fisher discusses a variety of tips for distinguishing the retina from posterior hyaloid. For the link to the full episode, click here. How do you distinguish retina from posterior hyaloid? The easiest way to distinguish the two would be to look at the intensity, there is no blood in the eye, and the patients have had flashes and floaters, and you’re looking with an ultrasound probe. I often will examine people with flashes and floaters first with ultrasound using their lids, not the sclera, I always shoot through the lids and apply adequate lubricant. I happen to use a gel, and I prefer one that melts as opposed to one that’s methylcellulose-based, as patients have a lot of trouble getting it out of their eyes. I first look to see whether the material I’m looking at it — if it’s clear media — is a strong reflector. The vitreous phase is usually not. It gets a little funnier with vitreous hemorrhage simultaneously, but most of the time you can tell by the reflection which is weaker than retina. Its movement is different. Assuming that the vitreous has separated from the optic nerve and the macula, it’s going to move at a much faster pace rather quickly, as opposed to the retina, which is usually slower-paced, and more undulating as opposed to the rapid movement when the patient moves their eye and you hold the probe still. Those are the two major things: the real-time imagery of a vitreous phase separation, and then again, whether or not the materials go to the head of the optic nerve like the retina would, versus a vitreous separation where there a clearer area between the vitreous phase and the optic nerve, recognizing that the ora is always attached. Imaging it that way makes it much easier to distinguish those two things. OphthalmicEdge is a free, educational two-portal site with one goal: to provide valuable resources and a better understanding of ophthalmic subjects for both professionals and visually-impaired patients dealing with changes.